How do you encompass the wedding clients venue, the experience, the theme, and this unique resort, the landscaping, all that the Sonesta Resort Hilton Head Island Hotel offers? Back in May of last year 2017, I had the honor and privilege to capture this type of wedding image. 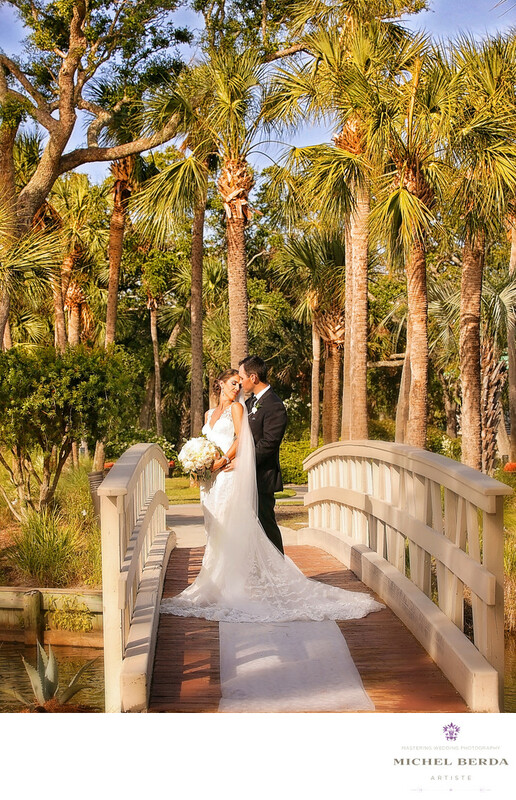 Being very familiar with this venue, Sonesta Resort Hilton Head Island Hotel, I knew that this venue had an amazing bridge, with beautiful palm trees in the background, that would truly give any wedding clients a spectacular wedding image. The key to all of this was the posing that is true to the couple feelings, the lighting and last the most important part of a great wedding photograph is the composition. You can clearly see all of these key elements in this true Lowcountry wedding image of the couple. Keywords: Charleston (1179), Michel Berda (1140), photographer (1125), Sonesta Resort Hilton Head Island Hotel (6), Wedding Photographer (1254), wedding photographer Sonesta Resort Hilton Head Island Hotel (6), wedding venue Sonesta Resort Hilton Head Island Hotel (6), weddings Sonesta Resort Hilton Head Island Hotel (6).